Introducing our Passion Flower & Vanilla candle, No. 4 in our signature Parks Exclusive collection. 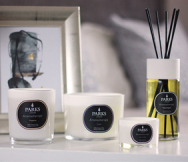 Made from 100% natural wax, this exquisite candle has been carefully developed using the finest essential oils and ingredients, including passionfruit petals, raspberries, and vanilla pods – creating a spicy, sweet, and playful scent throughout your home. With its intricate blue, ivy and white petals, the passion flower has bags of exotic, far-flung appeal. It produces a subtle, floral aroma, which, like lavender or chamomile, is renowned for its stress-relieving properties. It’s this natural aroma which we’ve extracted for our No. 4 Parks Exclusive, helping you enjoy the soothing, mood-lifting properties of this delicate flower for yourself. To create the unique aroma of our No. 4 Exclusive, we’ve paired the alluring scent of passion flower with the timeless spice of the vanilla pod, delivering a fragrance which melds the unusual to the familiar, and in blissful harmony. The smooth, invigorating scent of vanilla underpins the delicate top notes of passion flower, creating a balanced and complex fragrance that’s further strengthened by the sharp, bright scent of raspberries. Ideal for the kitchen or bathroom, or any other room in need of a unique, fresh, and youthful uplift, our luxury No. 4 candle transforms your home with its complex and decadent fragrance. The candle provides up to 50 hours burn time, and, thanks to its elegant presentation gift box, makes the perfect gift for a friend or loved one.